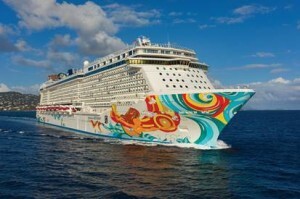 Norwegian Getaway at 145,000 tons carries just under 4,000 passengers. Norwegian Cruise Line has been named “North America’s Leading Cruise Line” for the first time, along with being honored as the “Caribbean’s Leading Cruise Line” for the fourth consecutive year at the 2016 World Travel Awards, announced Sunday evening at the Caribbean & North America Gala Ceremony in Ocho Rios, Jamaica. Earlier this month, Norwegian also received awards for “Europe’s Leading Cruise Line” for the ninth consecutive year, “Europe’s Responsible Tourism Award” for the second consecutive year and the award for “World’s Best Cruise Spa” for the Mandara Spa® on board Norwegian Cruise Line. Norwegian’s fourteen ships sail a variety of exciting itineraries, from the Caribbean to the Panama Canal, Europe, South America and the Mediterranean, as well as the Far East and Australia. Norwegian has eight ships, including the line’s newest ships, Norwegian Escape and Norwegian Getaway, cruising to the Caribbean and the Bahamas during the Winter/Spring 2016/2017 season from convenient homeport locations including Miami, New York, Tampa, Port Canaveral (Orlando), New Orleans and San Juan, Puerto Rico.